If I told you that, in many schools in this country, over half of the graduating class dropped out before graduating, you would think that statistic sounds incredible. But, it’s true! Not only is it true for many schools in this country, but also true for many school districts, cities, counties and states that are responsible for the education of our children. According to the Urban Institute’s report, Losing Our Future: How Minority Youth Are Being Left Behind, the graduation rate is worse for minorities. School graduation rates are low for all students, with only an estimated 68% of those who enter 9th grade graduating with a regular diploma in12th grade. 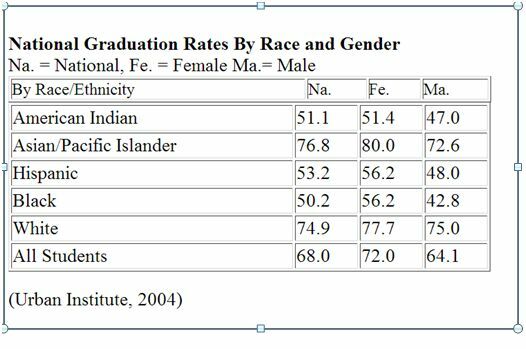 But, as the table below makes clear, they are substantially lower for most minority groups, and particularly for males. According to the calculations used in this report, in 2001, only 50% of all black students, 51% of Native American students, and 53% of all Hispanic students graduated from high school. Black, Native American, and Hispanic males fare even worse: 43%, 47%, and 48% respectively. In a U.S. government report entitled, Truancy: A Serious Problem for Students, Schools, and Society, the report suggests that the reason(s) behind high school truancy take on many facets. Of the many problems associated with truancy and high school dropouts, academic readiness of the student (e.g., a particular student’s ability to do the work) is the most common factor. It only follows that a student who is prepared for academic challenges in the classroom is more likely to stay in school and thrive, than a student who is not. Research is clear that ninth grade is a “make or break” year for students. Student’s academic readiness as a problem pales in comparison to the social-psychological problems that create high school dropouts. A “New York Times” article by Lynette Holloway brings to focus how social-psychological challenges facing educators today impact on dropout rates. In her informative story, On the Trail of Truants, and Their Social Problems, Lynette gives a chilling portrait of the social-psychological problems that belie dropouts. One major problem Lynette Holloway identified is absentee parents. From some parents who were too drugged out to force their children to go to school, to parents who worked two jobs and didn’t know if their children were going to school or not, … Parental involvement she found was the key. In other cases, the article stated that children wielded so much authority in the household that parents did not dare to challenge them when they refused to go to school. Often time, limited-English-speaking parents did not understand phone calls or correspondence from the Board of Education informing them that their child was required to be in school. And why is a high school diploma so important? Consider this: A. High school dropouts have a life span that is nine years shorter than people who graduate, B. Dropouts are more likely to face poverty, according to the U.S. Census Bureau, C. Typically high school dropouts earn $19,000 a year, D. High school graduates earn $28,000 a year on average, F. If you drop out of high school, your chances of running afoul of the law increase, G. Nationally, 68 percent of state prison inmates are dropouts. Sheriff Jerry Brogdon of Berrien County, Ga., sees those consequences every day at the Berrien County Jailhouse. Graduation rates for the high school class of 2002 show that less than 65 percent of all students attending public schools in the South complete high school with a regular diploma. This level falls below the national average of close to 70 percent. Findings also show very large disparities between students from different racial and ethnic groups. A graduation gap of about 27 percentage points separates the highest- and the lowest-performing groups. Historically disadvantaged minority groups in the South have graduation rates that range from 55 to 58 percent. Findings in a The Advantage Press study, The Problem of Truancy, identify and suggest ways to deal with truancy. 5. Involve local law enforcement in truancy reduction efforts. The problem with high school dropouts is well document in a review of literature on the subject. What is not found in the literature is a working solution to the problem. In an effort to solve the problem, I need to construct a plan that incorporates the five primary elements of a comprehensive community and educational strategy to combat truancy, found above. As a result, I have designed a three-stage comprehensive dropout identification and prevention model. In the first stage, Identification and Classification, students with truancy problem are identified and classified relative to the severity of the problem. Many school systems are obligated by state mandate to call parents when their children miss school. Keeping parents informed is the first element in the first stage. Using an automatic dial system to contact student homes, and informing parents of their child’s absence is task in the first stage. Schools can use the automatic dialing to proactively notify parents of the latest school event—such as a school play, bake sale, or blood drive, parent teacher meeting, PTA. Using the auto dialer can enhance contact between the parent and the school. Similarly, the auto dialer can be used to broadcast a snow day or other critical event. Alternatively, parents can call into the system 24 hours a day to learn of their child’s homework assignments, the lunch menu, or any other information that administrators deem important. Once parental contact is made, students are classified in one of two categories. In the first category, the student is not deemed to be a non-truant and released from truancy obligations. This is determined through student grade history, parent and teacher interviews, and review of past and present truancy records. 3. Create meaningful incentives for parental responsibility. In the prevention stage, students are deemed to be truant and placed on a plan that identifies the reason for their truancy, and the student is provided counseling, tutoring, monitoring and mentoring. Parents are contacted on a weekly basis to give them updates on the progress, and will continue to receive calls when the student is absent from school. Parent, teacher meetings will be held to continue dialog about the problem, and other solution discussed. 4. Establish ongoing truancy prevention programs in school. The truancy problem is deemed hopeless, when the student is placed in the third stage. Corrective measures are in need to solve the problem that will result in another dropout. Truancy Call sends to parents whose children are absent from school, an automated phone call to their landline or mobile phone (in English and a variety of other languages), a text message to their mobile phone and an email. The parents are then required to respond to these messages by the same manner. Should a parent not respond an hour later they will be called again (text messages sent once only) then repeatedly until the parent responds up until 8pm (over a third of parental responses occur between 6-8pm). can add the appropriate attendance code and date the student is expected to return and this is written back on to the Management Information System operated by school. Not only does the system provide “First Day Contact”, it does more. Rather than just sending a one-way message which will result in a mass of parents/guardians calling back and clogging up school reception. Truancy Call, allows parents/guardians, as part of the automated phone call, to speak a reason for their child’s absence into the phone and should they have received a text message, then they can text the reasons for their child’s absence back. Truancy Calls innovative service has met with unprecedented success since launch in 2005. The service has repeatedly received recognition and praise throughout the Education and Technology industry.